8. (Onchu), the splendid descendant of the sage, his speech was concerning Christ. descendant of the sage etc., i.e. Onchu his name : in the oratory of Relic na n-aingel (the Angels Graveyard) in Cluain mor Maedoc he is. 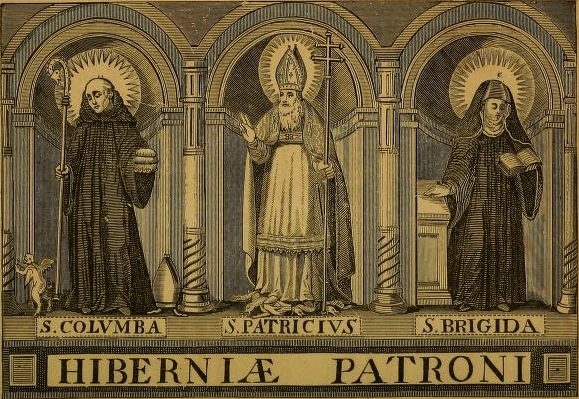 A good poet was he, and to this he gave heed, to collect the relics of Ireland's saints. He used not to stay in any church without some of (the saint's) relics being given to him. So that he had a great shrine of the saints' relics which he had collected. Now he went to Cluain mo Maedoc i.e. Maedoc hua Dunlaing of Leinster, and not Maedoc of Ferns. Maedoc happened to be alive before him. "Somewhat of thy relics (cut) off thee for me, O cleric, that they may be along with these relics." "That is hard," says the cleric. "It is to be done, however," says the poet. So the cleric cuts off his little-finger and gives it to the poet. Then the cleric is pained thereby, and he declared: "What thou hast collected," says he, "will be here, and thine own relics also." And this has been fulfilled. Splendid descendant of the sage, i.e. in Cluain mor Maedoic he is, i.e. of Connaught is he. 'Tis he that collected the saints' relics in the oratory of the grave-yard of Cluain mor Maedoic. 8. D. SEXTO IDUS FEBRUARII. 8. ONCHU, Mac in Eccis, of the Connacians. It was he that collected a great deal of the relics of the saints of Erinn to Cluainmor-Maedhog. A very ancient vellum old book, which we have mentioned under Brighit, at 1st February, states, that Mac-in-Eccis was, in his manners and life, like unto Ambrose. The ancient calendars of Ireland contain allusions to this holy pilgrim, at the present date. Thus, on the 8th of February, the Martyrology of Tallagh registers Hua ind Egais, who collected the relics of the saints. We are further informed, that his discourses were always regarding Christ. The Calendars of Cashel and of Marianus O'Gorman celebrate, likewise, the characteristics and pursuits of this most religious poet. In the Kalendars of Scotland, our saint was likewise celebrated. The Kalendar of Drummond enters the natalis of the confessor Oncu, at the vi.Ides —corresponding with the 8th—of February, in the island of Hibernia. The Irish name for this saint was Onchu; and Colgan says, that word means " a water-dog" or "leopard."... Having visited St. Finian the Leper, this latter holy person was urged to undertake a pilgrimage, in company with our saint. Onchu wished to journey through all parts of Ireland, visiting various hermitages, cells and monasteries, where saintly men dwelt, at that time, or during any previous period, so that he might collect together relics, at the different localities, hallowed by connexion with those servants of God. Impeded by his infirmity, St. Finian declined, however, assenting to this proposal. He even sought to dissuade Onchu from such a purpose, saying it was decreed, both of them should die in that place, where they then were. From this account, and sequel of the narrative, it would appear, that the place, at which St. Finian and St. Onchu held this interview, must have been at Clonmore, in the county of Carlow. Nevertheless, our saint, full of his pious intention, resolved on prosecuting his journey alone, and immediately he set out on his travels. The holy man formed his resolution of visiting each place, throughout our whole island, in which he thought there might be the most remote chance for discovering or procuring relics, of any Irish saints. He had hoped, that such a collection might afterwards serve to increase devotion, and preserve the memory of those pious servants of God, among the people. Such purposes he accomplished; for, whatever monastery or cell, he visited, furnished some contribution to the store, he had previously acquired. Not only did he obtain memorials of the dead ; but, he received even certain gifts or articles, from pious men, whose reputation for sanctity had been already established, in the Irish Church. All of these precious treasures, Onchu deposited, in the same reliquary. ...having nearly accomplished his original purpose, he came to the flourishing monastery of Clonmore, in Leinster, over which the illustrious Maidoc or Aidus, son to Eugenius of the Leinster family, then presided as abbot. St. Onchu received kind hospitality, and he demanded some memorial from this holy superior. Through humility, however, Maidoc refused such a request ; when, it is said, his finger fell to the ground in a miraculous manner. Our saint immediately took it up, and placed it among his other relics. Having felt pain, caused by the loss of his finger, St. Maidoc was moved by Divine inspiration, to cry out: " All the relics thou hast collected must remain in this place, and thy remains shall be with them." The event justified this prediction ; for, the precious reliquary, with its contents, was preserved long afterwards, in Clonmore monastery. The prophecy of St. Finian, the Leper, was also fulfilled, for his bones reposed, together with those of our saint near the cross, to the south of it, in the adjoining cemetery. There, St. Onchu found his last resting place on earth. 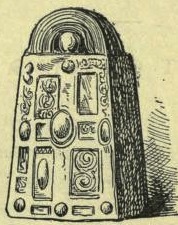 When he died, too, at Clonmore, all his relics were there religiously preserved. St. Onchu lived, probably, during the time when Aid, the son of Ainmireach, King of Ireland, reigned, from about the year 568 to 594, since our saint was contemporaneous with St. Maidoc of Clonmore, said to have been an elder, and a uterine brother of that monarch Aid.